Home News	No Need To Yell Fore! When you win as many titles as the Westchester Country Club Ladies? Golf teams did this year, expect the celebration to be big, and it was, November 29. In his opening remarks at the event, Club President Tom Pisano highlighted the strength of the women?s membership from the start, quoting from an old club handbook, and praised its phenomenal growth over the years. The team of Laura Coash (captain), Ellen Oswald, Connie Marlatt (2019 Ladies 18 Tournament chair), Elisabeth Muhr, and Gail Flanagan won the Interdistrict Playoffs of the Women?s Metropolitan Golf Association held at Rockaway Hunting Club. The ladies qualified by winning the Series 1 matches with a total of 57 points. This was the first time WCC has won in 41 years! Captains Karen Hios and RoseMarie Mecane led their team to the Women?s Interclub Niners Golf Champions of Champs title. Hios, WCC?s 9-hole champion, and runner-up Sheila Moran bested ten other area clubs. The team captained by Kathy Flynn and Corinne Raicht won the Westchester Interclub Golf League, Flight 1 Division. They competed in a playoff against the winners of Flights 2 and 3, Bonnie Briar and St. Andrew?s. Lynnann Cuddy and Suzanne O?Brien successfully represented WCC in the playoffs. And they also brought home the 2018 Interclub title. 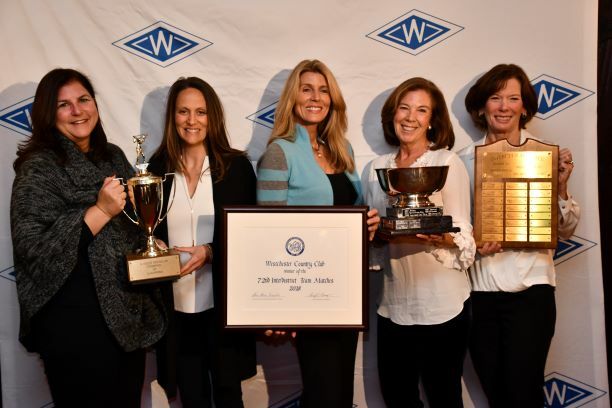 Led by Lynnann Cuddy, Westchester Country Club had the most overall season points, ahead of Siwanoy, Winged Foot, and Apawamis clubs. Westchester Country Club will host the 2021 US Women?s Amateur, the biggest and best women?s amateur tournament in the world. ?The club looks forward to being a platform for the growth of Women?s Golf.